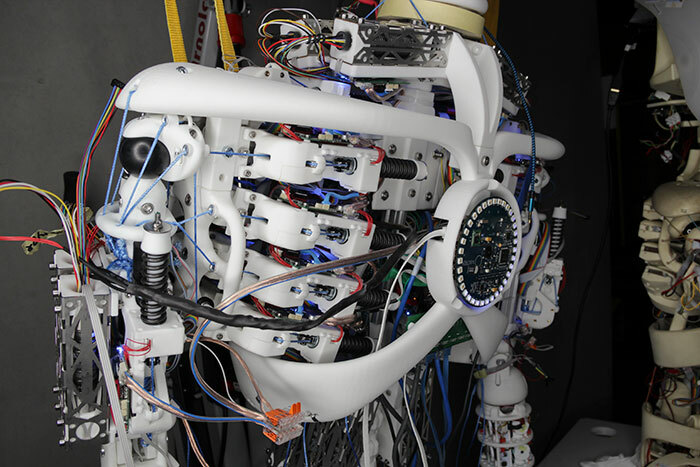 An open-source research project of the Technical University of Munich, Roboy 2.0 aims to get as close as possible to the form and function of a human being. Courtesy Roboy. Arriving at a train station only to find that the next train doesn’t arrive for 15 minutes is a familiar scenario. But rather than waiting that long, what if a bicycle-riding robot could do the transport instead? If a research project out of Germany has its way, that could someday be a reality. 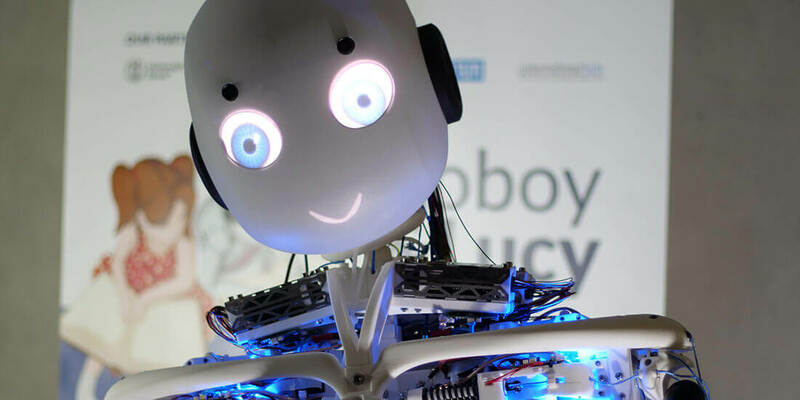 Roboy 2.0 is an ambitious interdisciplinary project at the Technical University of Munich (TUM) in Germany to design a robot with the closest possible likeness to a human being. Roboy can already pedal a bike, shake hands, and talk. It can also play the xylophone—an extremely complex task for a robot, given the dynamics required. By summer, Roboy 2.0 will be able to serve ice cream from a stand, and by 2020, it will be able to perform basic medical diagnostics. The research is entirely open source and will be foundational for further developments in robotics, health care, artificial intelligence, and audiovisual data processing. Roboy 2.0 can blink its eyes, move its head, and talk to people. Courtesy Roboy. To achieve this, a team of more than 100 current and former TUM students—experts from a wide range of disciplines—have been developing the robot with a global network of scientists. Partners include the KTH Royal Institute of Technology in Stockholm (neuroprosthetics), the Chinese University of Hong Kong (algorithms for controlling the robot), Oxford University (loading of artificial tendons as they grow), and TUM (robotics, real-time systems, and product-development methods). Mechanical reproduction of the human body with such detail is only possible at great expense. Engineers use advanced technological methods such as 3D printing, generative design, and other processes to replicate bones, muscles, and tendons instead of simply replacing joints with motors, as is typical in robot construction. The structure, weight, and composition of the bone-like components play an important role. The generative-design functionality in Autodesk Fusion 360 helps scientists to significantly reduce the weight of important components while at the same time maintaining stability. Generative design helps reduce Roboy's weight and part count. Learn about generative design for manufacturing, used to reduce the weight of Roboy's parts. The aim is for Roboy to learn how to walk independently. But what is essential for Roboy’s first steps, however, is a stable, lightweight frame, which can be achieved with generative design. 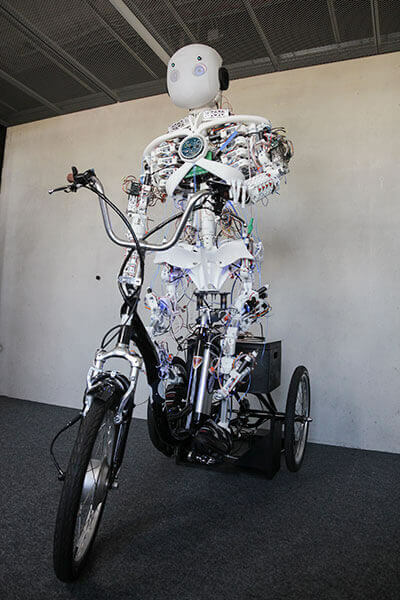 The Roboy 2.0 humanoid robot can already ride a bike. Soon it should be able to sell ice cream. Courtesy Roboy. Generative design is currently being used to develop the hips. Thanks to calculations in the cloud, the team needed just three days to develop the initial prototype. Generative design will be used in the development of the back of the skull; the spine and Roboy’s movable elements will be optimized in the medium term. Fusion 360 designs can be used directly in 3D-printing processes, and the files created can be converted directly into 3D-printed objects without complication. Almost all of Roboy 2.0’s parts are laser sintered and 3D printed in plastic-like materials. The geometric freedom of 3D printing allows the team to design components without any constraints imposed by manufacturing limitations. Tool-free production also saves time and money. A closeup of Roboy’s torso. Courtesy Roboy. Although the primary purpose of Roboy 2.0 is research and innovation, the knowledge acquired during its development is already having an impact in other areas. 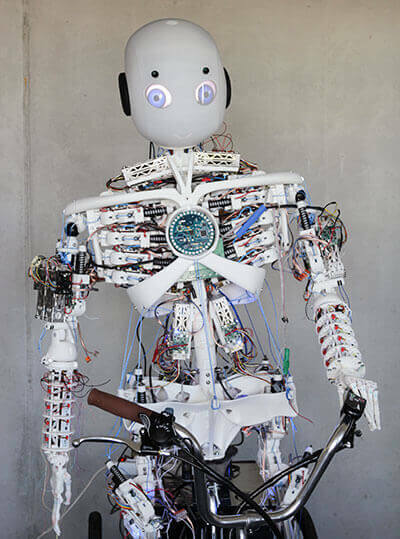 “The musculoskeletal nature of Roboy yields a plausible continuation of a more biological model of the human body than what is commonly used outside of neuroscience,” Hostettler says. To that end, the model has been invaluable for developing innovative prostheses. Neuroscientists are also using knowledge from the Roboy 2.0 project to improve understanding of how the human body coordinates interaction among more than 600 muscles.